Anything Hermes is sure to become a coveted piece. However I am not so sure if this silver and leather bracelet is a savvy piece of jewelry. There is an half Hermes logo stamped on the body of the bracelet and the usage of a leather strip to secure the bracelet is unique. I just can't figure out how to tie the two strips of leather together by myself. But just wearing the silver piece as a cuff does not really appeal to me. 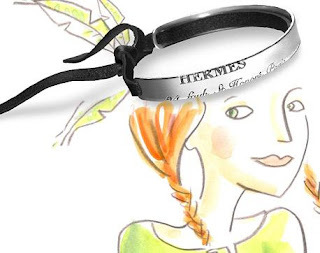 I am looking forward to the day Hermes will offer leather strips in different colors for purchase so a gal can match the bracelet to her outfits. At the cost of 290 Euro (about $460), perhaps Hermes will become generous by offering 2 leather strips so a gal can interchange depending on the outfit. I usually have issues whenever I need to put a bracelet on so this won't be an exception. Is this a savvy bracelet to you? It's so expensive! I guess you would only wear it for the label right? dat bracelet are not really attractive, sum more expensive to0, but since the logo is out there, maybe it can shows up somebody status-high society maybe.. Thank you for reading my blog! I really appreciate the comments! I adore Hermes but I can't seen to have the urge to run out to really investiage the bracelet.